The first step is to make sure your payroll renewal was actually processed. For this step, you should log in to the Sage portal to review the payroll expiration date. You can also view the date Sage 100 thinks payroll expires by starting Sage 100 and selecting File – Run and typing *INFO. 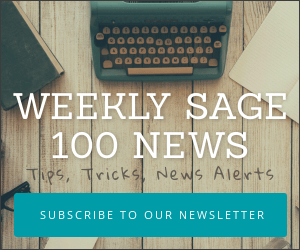 If the expiration date on your Sage 100 payroll shows that the system was renewed and you are still receiving error messages then you’ll probably need to contact Sage. If the expiration date shows that you are expired yet you are certain that Sage processed the renewal then proceed further and attempt to manually update your payroll keys. There is an issue in Version 2017.1 and Version 2016.4 (ONLY) where the update button does not work, instead, you have to do the Edit / Activate for payroll subscription keys to be updated. If you’ve verified that Sage received your renewal and you are still receiving an error message about your payroll soon expiring then try to refresh the keys manually within Sage. This may be a two-step process. Now click “Update”. In some cases it may tell you that you are up-to-date and there are no registration or subscription changes. If successful, you should see the “Activation was successful” message. Now go back to File – Run and type *INFO to verify the next payroll subscription update date has been added to your Sage 100. These instructions are valid for both Sage 100 and Sage 100cloud. Please note, payroll updates and tax tables will no longer be available for Payroll versions 2017 or earlier after the December 2019 year-end. Create a masreg.ini text file and put that onto the root of C on the server. (Copy / paste the values from Portal). The Sage 100 or Sage 100cloud installer reads everything automatically from the file. Place the above masreg.ini into the root of the server prior to beginning the Sage 100cloud installation. Making the decision to move to a cloud host seems like it should be a simple thing. In most cases, it is. Unless you’ve overlooked these five key questions. Cloud hosting requirements are often more complex than you may initially believe. Once you move your server outside the walls of your company office there are many important things you should consider. How Frequently Do You Backup? You’ll want to have at least a week’s worth of daily backups just in case a file needs to be recovered. Some cloud hosts charge a fee for recovering files. If you need to frequently recover deleted files it’s best to find out the policy up front. Ask how quickly your files can be recovered. Is support available after-hours and on weekends? Two-factor or multi-factor authentication is one of the best ways to secure a login. Instead of just a password to login, what multi-factor uses is both something you know (your password) and something you have – typically an authentication tool which generates a one-time use code. Combine that code with your password and you have security which a hacker cannot easily breach. There are many different multi-factor tools available. Be sure to ask which toll your cloud provider works with. Am I Sharing Server Space With Other Companies? In many cases dozens of companies can be hosted on the same server. Multiple users on the same computer can cause issues in a few ways. Read more: What is a dedicated server? Are You SSAE 18 Certified? Many organizations such as nonprofit organizations, government entities, financial service companies, IT, transportation companies, health care providers, construction companies, insurance agencies, manufacturing, real estate, and trucking now require statements of compliance for their auditors. Make sure you first ask your auditors what their requirements are before choosing a hosting provider. Do You Support VPN (Virtual Private Networks)? A VPN encrypts your Internet traffic from point to point. This means that even if someone were snooping in on your data, the information would be fully encrypted and unusable. Some companies, especially those in highly secure industries such as finance or healthcare, require that all employees use a VPN when connecting to their servers remotely. The team at Summit Hosting have been hosting Sage 100 and most of the popular third-party add-ons for over 10 years. If you’re considering moving Sage 100 / Sage 100cloud to the cloud, contact Summit Hosting to learn more. Don’t forget to mention “Schulz Says” for special pricing!